Gunter and Burnett are both back on the field for the #Packers defense. #Packers are shadowing Dez Bryant with CB LaDarius Gunter, as they did last week against Odell Beckham Jr. What a story Gunter is writing. #Packers find the end zone first on the 34-yard Rodgers-to-Rodgers connection!
. @AaronRodgers12 goes up top to Richard Rodgers for SIX! 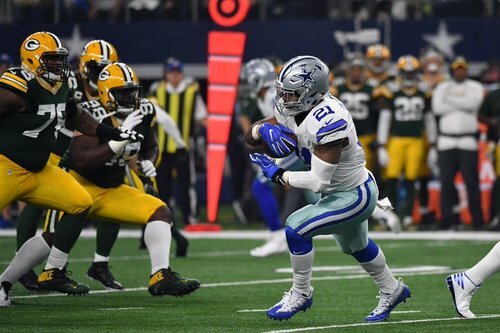 #Packers had that bottled up for no gain, if not a loss, and Ezekiel Elliott got 9 yards. He's real fast. For the first time this game, #Packers moved CB LaDarius Gunter to Cole Beasley. Had been matching up against Dez Bryant. 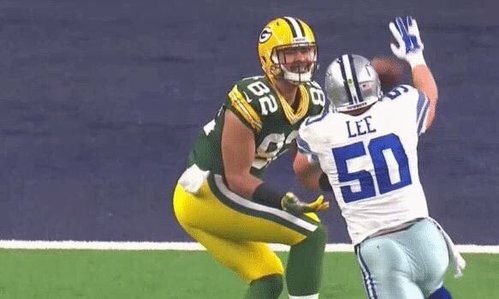 #Packers CB Damarious Randall was about 5 yards off when Cowboys WR Terrence Williams caught Prescott's pass. Penalty wipes it out. #Packers rookies Kenny Clark and Dean Lowry getting quite a bit of snaps early. Lowry even on the field for third-and-20. Packers rush to contain on that third and long, force Prescott to be pocket passer, overthrows Butler. Cowboys QB Dak Prescott just 4-7, 52 yards, 80.7 rating on first two drives. And he just badly overthrew open WR on third down. That throw was just ridiculous. Aaron Rodgers playing at the top of his game. #Packers QB Aaron Rodgers' trust in Geronimo Allison grows exponentially by the week. That's a trifecta of third downs the #Packers have converted this drive. Aaron Rodgers just threw it up, let Davante Adams make a play. That's three consecutive third-down conversions for the #Packers on this drive. Rodgers is playing really well. 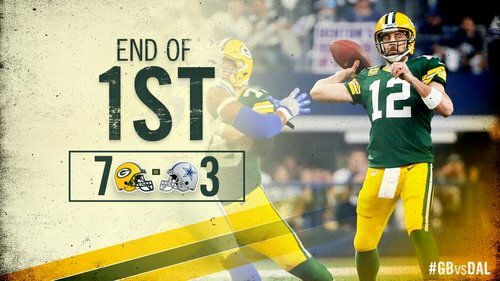 #Packers on top after one in Dallas! For all my followers who have been asking about him, #Packers rookie WR Trevor Davis got a snap to end first quarter. So there. Six different receivers have caught passes for the Packers. 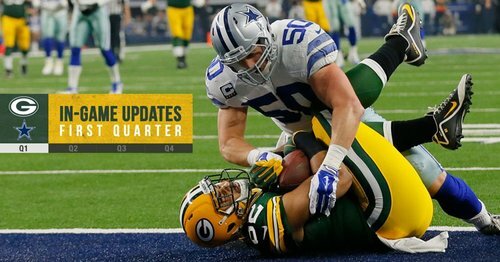 End of the first quarter: #Packers 7, Cowboys 3. Rodgers has the offense at the 9-yard line. He's 8-of-11 for 126 yards and a touchdown. Montgomery on the carry after motioning from WR and it's a touchdown. Recapping the opening quarter in Dallas. 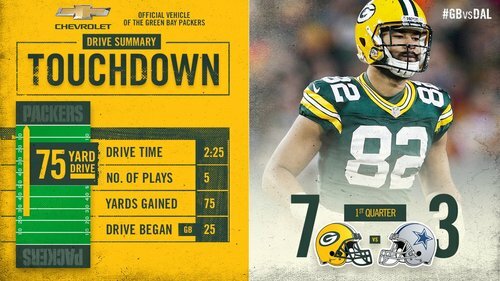 Aaron Rodgers is 9-13, 132 yards, 10.2 average, TD, 127.7 rating ... and #Packers have a 14-3 lead. 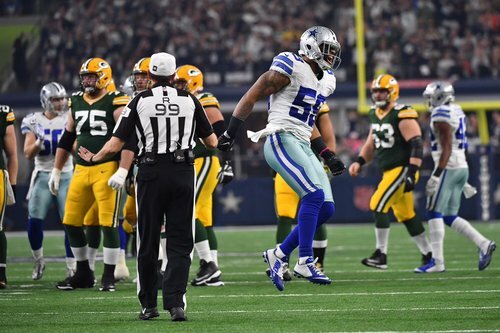 Cowboys don't even know what hit them.